WAEC Students in Nigeria has just concluded the 2017 West African Senior School Certificate Examination WASSCE for May/June. This exam was also written in Gambia, Ghana, Liberia and Sierra Lone. As usual, these students are now waiting anxiously for their WAEC Result 2017/2018 to come out. Currently, WAEC results has not come out. Everybody should be patient until is it released because school teachers are still marking the papers in different states. When will WAEC Result 2017 come out online? This is a question most students asked after writing the WAEC examination because they want to see their result to enable them participate in JAMB so as to gain admission into the university. Sincerely speaking, nobody knows the specific date when the results will be released and published online, all we know is that the result usually come out around July/August or September every year. 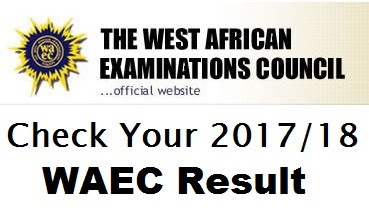 While you await the release of the WAEC results 2017/18 it will be wise for you acquaint yourself with the methods of checking your WAEC result on the WAEC Direct Online Result Checker database so when the result comes out, you will not find it difficult to check your result with or without a scratch card, print out the WAEC result or send it to your email. You will need the following information to be able to check and print out your WAEC result this year. Usually, students always ask us on comments about how to check their WAEC result online with using scratch card. Is this possible at all? Some will say yes it is while some will say No, it is not. However, I have already previously written a an article on How to Check WAEC Result 2017 without Scratch Card Here. If you have missed it, please read it now. To print of your WAEC result is very easy, but this is done when after your have filled the information required on the WAEC official website. once you have clicked "Check My Result" as explained above, all you have to do is to click on Print immediately your result pops up, select the printer that is connected to your PC or mobile phone and click OK, then your result will be printed on A4 paper. So many people decides to send their WAEC result to their email addresses so that they recheck the results whenever or where ever they need it. This is because your WAEC scratch card allows you to check your WAEC result online five (5) times after which the scratch card becomes invalid. But how do they do it? It's very simple. When fill the information to check your waec result as explained above, you will need to tick the box which asks you if you want to sent it to your mail. Then enter your email address correctly before you click on "Check My Result" as explained above also. This will send your result to your Yahoo Mail, Gmail, Hotmail, Outlook or any type of mail you use. Over the years, we have seen people ask us about how to check WAEC result on iPhone, iPad and Android Phone which we have also written about before but have decided bring it to light again for those people who missed it before. If you have a mobile phone that has internet connection with an option to print documents through a printer using either Bluetooth or wire/cable, then follow the Steps by Step Guide on how to Use Your Mobile Phone to Check Result written here. With evolving new technologies in world today the West African Examination Council (WAEC) has come up with SMS short codes people can use to check their waec results if they are not in an internet coverage area. The codes depend on the mobile network you use. It could be MTN, Glo, Airtel or Etisalat. This is how it it done. What is a WAEC Scratch card PIN? According to WAEC website, the WAEC Scratch Card PIN stands for Personal Identification Number. In WAECDIRECT, it is a unique 10-digit or 12-digit number that is required to access the service. The service enables direct access to a candidate's results via multiple channels. The PIN is found on a valid WAECDIRECT Scratch card and is revealed when cover patch on the reverse side of the card is carefully scratched off. What is a WAEC Scratch Card & what is it Used for? The WAEC Scratch card is a strong paper / plastic card with a scratch patch on the reverse side that conceals a PIN required to access the WAECDIRECT service. The Scratch card applicable for the WAECDIRECT service is marked "WAECDIRECT ЕЕAccess Card" on the face. Where can Students Purchase the Scratch card? Everybody who need to obtain the WAEC Scratch card may purchase at the National Office of WAEC and at any of its zonal and branch offices across Nigeria. It may also be bought from any of the branch offices of Fountain Trust Bank Plc across Nigeria. From time to time it may become available at any other outlets so designated by WAEC. Please Click Here to go to the outlets page. The reviewed price for the Scratch card is now N450. Note that you can sill buy it at approved business centers and cyber cafes. WAEC does not allow you to use the scratch card for ever. You are only allowed to check your results up to a maximum of 5 (five) times with the use of 1 (one) Scratch card, This why it is important to send your WAEC result to your email so that you can access it anytime you need it. In order to check further after exhausting the allowed 5 (five) times you will need to purchase another Scratch card which will entitle you to another 5 (five) result checks. Can Students use one Scratch card to check more than one WAEC Result? Never! WAEC will not allow that. Students are only allowed to use one Scratch card to check one result. For you to check another result of interest, you will require a new Scratch card. If you misuse a Scratch card by attempting to check another result different from the first one checked, you will be penalized as having used the card, and will be presented with the appropriate error message.